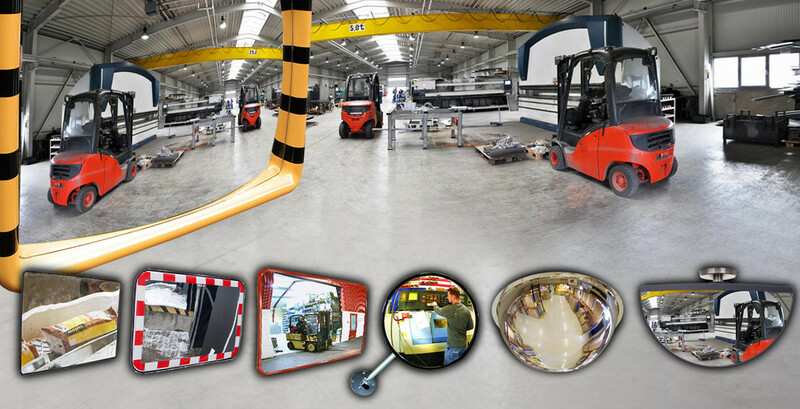 The TÜV-certified Dancop mirrors are an important part of maintaining occupational safety. In addition to the TOP sellers and well-known dome mirrors, this assortment extends into an immense breadth. The highly noticeable Check Point industrial benchmark increases operational safety and we have also developed a special surveillance mirror with concave curvature together with our specialist retail partners. Dancop is the only supplier that can produce this variant. For cost-optimized use, you will also find the EC observation mirrors in round and rectangular versions here. For industrial outdoor use, you get the TÜV and wind load certified industrial traffic mirrors, these are on the red / white eye catching edge omitted. Even with the industrial models you can, depending on the application and design, use different brackets. The range is rounded off by wide-angle and stacker mirrors. Dancop is the only manufacturer on the market that can offer TÜV certified and wind load approved products. Trust in our quality here, which the TÜV audits and certifies annually.